We've reviewed a couple of similar models in the past, most recently the cracking R-09HR from Roland's brand Edirol and despite the different name on the front this seems to be in many ways an evolution of those. 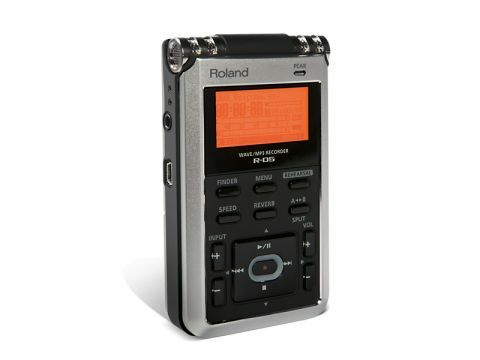 It's relatively compact for a fully-featured portable recorder with built-in mics, but thanks to intelligent layout all the controls are accessible and easy to use. Our one mild dislike on the practical side is that the headphone jack is on the side of the unit rather than on the top, which seems to be asking for trouble with stress on the connector if the unit is in a pocket. Against that, the display is very clear to read and operation is very quick, with no setup needed beyond setting recording level. Sampling rates up to 96kHz are available in linear PCM, as well as a range of MP3 rates. Judged both as a player and as a recorder, this unit seems to fall short of the higher standards set by the earlier Edirol devices. The sound is basically all there, not markedly coloured and plausible enough with simple music, but it just doesn't seem to get much beyond that. Playing tracks which we'd loaded from the computer, we felt that there was an unusually high degree of veiling in the upper midrange and treble, while the bass lacks real impact. The built-in microphones lack precision and recordings made from the line input compound this, with at times what sounds like 'beating' behind sustained high notes. Perplexed by this, we ran some basic lab tests and found that distortion is above average and jitter some of the worst we've seen from any digital device.